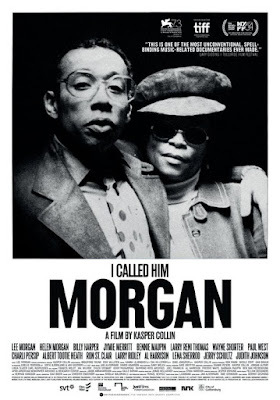 Last night I went to Bloor Hot Docs in Toronto to see the documentary I Called Him Morgan. Most jazz fans should be familiar with trumpeter Lee Morgan from his days with Art Blakey and the Jazz Messengers and Blue Note albums like Sidewinder. These same fans probably know that Morgan was murdered by his wife Helen on a cold snowy night outside a New York City club in 1972. But if you're like me, you know nothing about Helen Morgan. And that's what I Called Him Morgan is about. Director Kasper Collin made the 2005 documentary My Name Is Albert Ayler about another jazz musician who died prematurely. The biggest problem he had was there was very little info about Helen Morgan. She died in 2006. Fortunately Collin discovered that teacher Larry Reni Thomas interviewed Helen just before her death. After acquiring the interview, he did more interviews. The most important interview was with tenor sax legend Wayne Shorter who at first didn't want to discuss his days with Art Blakey and Morgan. Other musicians interviewed include Jymie Merritt, Bennie Maupin, Paul West, Billy Harper, Tootie Heath, Larry Ridley and Charli Persip. Maupin was very close with Morgan. They frequently toured together during his later career. So he knew Helen well. And Harper was at the club when Morgan was murdered. So with that and the interview with Helen, we get a clearer picture of the relationship. Shorter talks about Morgan's heroin addiction that forced him out of the Blakey band. By 1965, Morgan looked like a homeless person. And this was a guy known as a sharp dresser. We discover that Helen Morgan helped Lee kick his habit. She was much older than him so I guess she was a surrogate mother. She allows him to be productive again. So what happened? Jealousy of course. Helen thought Lee was unfaithful. On the fateful night of Feb. 19, 1972, Morgan was playing his usual gig at Slugs in New York City. That was his home base when he was in New York. In the middle of a raging blizzard, Helen decides to confront Lee and she brings a gun. She shoots him and Lee Morgan is dead. Helen is arrested and eventually pleads guilty to manslaughter. She claimed she shot Lee by accident. Then she moved to Wilmington, NC and that's where Thomas met her and interviewed her. Thomas had planned to continue the interview but Helen died before he could do that. I Called Him Morgan does a good job in telling a story that had never been told because it was thought that Helen Morgan disappeared back in the 70s. And because this murder happened during a blizzard, cinematographer Bradford Young gives the film a mystical look. Add plenty of Lee Morgan archive footage and photos and this film is a must for jazz fans. Check out the trailer.